What is Donut for Onboarding? Welcome your new hires with Donut! 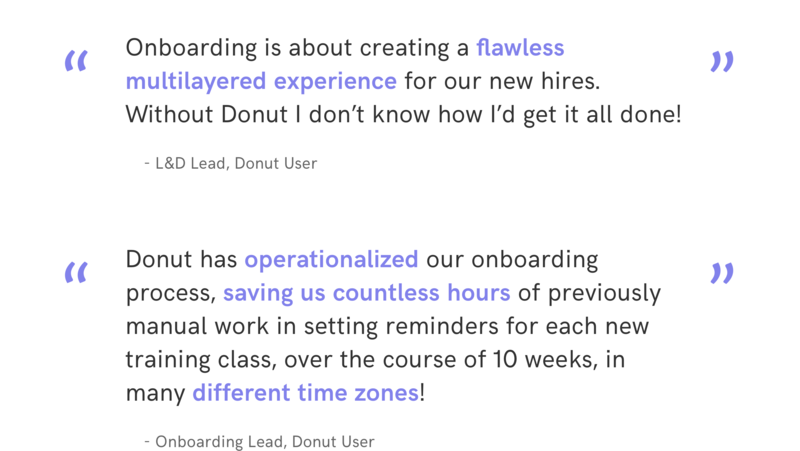 Donut for Onboarding allows you to set up an automated employee onboarding program, giving all your new hires the information they need when they need it, and helping them get to know your team and company better. It also keeps other stakeholders, like managers, in the loop and helps them welcome their new hires better. Learn more about why onboarding matters and how we can help. Donut automatically sends scheduled messages and polls, makes introductions, and assigns tasks to your new hires, managers, and anyone else involved, all via Slack. Donut provides an admin platform to manage the onboarding process, where you can set up the automated schedules and content as well as monitor your new hires' progress. How does Donut help with onboarding? Can be used by HR, Operations, IT, individual teams, managers, or anyone else involved in the onboarding process! Learn more about the difference between Premium Onboarding. What are some of the things I can do with Donut? Send new hires helpful tips, fun facts, reminders, and other important information to help them get up to speed faster. Set reminders and tasks for managers and other stakeholders starting with pre-boarding, to 1-on-1 meeting reminders, and more. Gather regular feedback with pulse polls to understand how your new hires' first few weeks and months are going. Easily implement a buddy system for your new hires. Automate reminders for managers to do 30-60-90 check-ins with their new hires. Connect new hires with someone new for lunch over their first few days and weeks. Make it easy for hiring managers to onboard their new team members and share best practices internally. What are Donut users saying about it? Get in touch with us using the chat bubble in the lower right corner and we'll be happy to help!